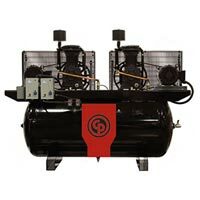 Chicago Pneumatic is one of the top manufacturers when it comes to the design and quality of electric reciprocating air compressors. There are many different styles and sizes available, so you can ensure that the one you purchase will suit your needs. Reciprocating air compressors are used in homes, auto shops and other businesses, and are proven to get the job done with quality. Feel free to give us a call and speak with one of our sales representatives if help is needed in selecting the compressor that will best suit your job. For a small business, residence or any compressed air need, the RCP Single Stage Compressor offers high volume, can operate on low amperage 208-230V or 115V* single phase power (*Portable Units), and are mounted on rugged receiver tanks to improve the consistency of your air flow. Each compressor comes complete with everything you need to optimize your work and minimize down time. All RCP Two Stage compressors come with a full 2 Year Warranty(including valves). The RCP compressor packages are available from 5 to 10 HP delivering 15.33 to 37.23 ACFM @ 100 psi. The RCP duplex compressors are available up to 20 HP and can deliver up to 50.50 acfm on single phase power. RCP duplex compressors feature two pumps and motors, along with an alternator which ensures optimal performance. RCP Two Stage compressors come with a full 2 Year Warranty (including valves).